Hundreds of people who claim they were abused by clergy affiliated with the Roman Catholic Archdiocese of Los Angeles can expect to be paid more than $1 million each in a $660 million settlement of their lawsuits. The deal, by far the largest settlement in the church's sexual abuse scandal, was reached Saturday, said Ray Boucher, the lead plaintiff's attorney. The archdiocese, America's largest, and the plaintiffs were to release a joint statement Sunday, he said. Another person with knowledge of the deal placed its value at $660 million, by far the largest payout in the church's sexual abuse scandal. The person spoke to The Associated Press on the condition of anonymity because the settlement had not been officially announced. That figure spread over about 500 claims would mean an average payout of a little more than $1.3 million per plaintiff. Some Roman Catholic orders  the Servites, Claretians and Oblates  will be carved out of the agreement because they refused to participate, according to the person with knowledge of the case. The settlement also calls for the release of confidential priest personnel files after review by a judge assigned to oversee the litigation, Boucher said. It wasn't immediately clear how the payout would be split among the insurers, the archdiocese and several Roman Catholic religious orders. A judge must sign off on the agreement. The release of the priest documents was important to the agreement, Boucher said, because it could reveal whether archdiocesan leaders were involved in covering up for abusive priests. Tod Tamberg, a spokesman for the archdiocese, did not immediately return a call seeking comment late Saturday. Earlier in the day, he said church officials would be in court Monday. 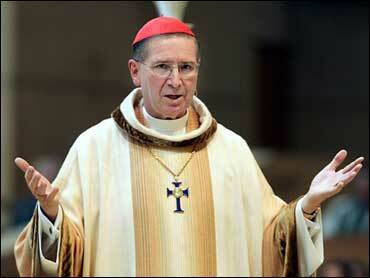 Cardinal Roger Mahony was to preside over Mass on Sunday at the Cathedral of Our Lady of the Angels. Plaintiff Steven Sanchez, who was expected to testify in the first trial, said he was simultaneously relieved and disappointed. He sued the archdiocese claiming abuse by the late Rev. Clinton Hagenbach, who died in 1987. "I hope all victims will find some type of healing in this process," he said. The settlement is the largest ever by a Roman Catholic diocese since the clergy sexual abuse scandal erupted in Boston in 2002. The largest payout so far has been by the Diocese of Orange, Calif., in 2004, for $100 million. Facing a flood of abuse claims, five dioceses  Tucson, Ariz.; Spokane, Wash.; Portland, Ore.; Davenport, Iowa, and San Diego  sought bankruptcy protection. The Los Angeles archdiocese, its insurers and various Roman Catholic orders have paid more than $114 million to settle 86 claims so far. Several religious orders in California have also reached multimillion-dollar settlements in recent months, including the Carmelites, the Franciscans and the Jesuits. However, more than 500 other lawsuits against the archdiocese had remained unresolved, most of them generated by a 2002 state law that revoked for one year the statute of limitations for reporting sexual abuse. Mahony recently told parishioners in an open letter that the archdiocese was selling its high-rise administrative building and considering the sale of about 50 other nonessential church properties to raise funds for a settlement. A Los Angeles County Superior Court judge overseeing the cases recently ruled that Mahony could be called to testify in the second trial on schedule, and attorneys for plaintiffs wanted to call him in many more.